Toronto: Bond Street Books, 2014. This is the perfect bibliophile’s beach read! It has all the thrills and spills of a blockbuster summer read, but what the characters are fighting for is the fate of The Word, or words, in the shape of protecting the most recent and most comprehensive edition of the North American Dictionary of the English Language. On a very cold and lonely Friday last November, my father disappeared from the Dictionary. And not only from the big glass building on Broadway where its offices were housed. On that night, my father, Douglas Samuel Johnson (! ), Chief Editor of the North American Dictionary of the English Language, slipped from the actual artifact he’d helped compose. In this near future, we drown in words but they all lack meaning, and much of that absence of content can be blamed on our increasing dependence on our devices. Instead of phones, the ubiquitous device is a Meme, and it serves not only as a means of communication, but also as an extension of self and a substitute consciousness. When the narrator enters a restaurant at the beginning of the novel, her Meme brings up the menu, but it then overrides her drink order, replacing a tea with a hot toddy, because it knows that she needs a stiff drink. Memes can also, crucially, give their owners the words or definitions they need if they have difficulty remembering a word or its meaning. Five cents a word. Touch of a button. This exchange is where the novel plays out: in the space between our use of language and its digital and corporate control. Definitions and their ownership are the territory over which the characters battle, and the book is a fun and rollicking ride through an alarmingly corrupt future. I was reminded often of Margaret Atwood’s MaddAddam trilogy, and especially of Oryx and Crake in which Atwood does the heavy lifting of her world building. They share the same kind of hysterical exaggeration of nefarious corporate interests that frightens, nevertheless, because, yes, people can be that stupid and that greedy. At first, the struggle seems to be over the ownership of words and their definitions, but when a virus that corrupts spoken as well as digital communication begins to spread, the stakes get suddenly and critically higher. 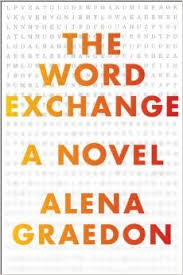 This is a first novel for Graedon, a graduate of Brown and of Columbia’s MFA programme, and while the novel reveals its author to be whip smart and savvy about what makes a page-turner, I felt that her editor could have been more firm about eliminating some redundancies and tightening up some of the plot. There are double and triple agents, but I never quite felt that the revelation had had the proper build up. There was a bit too much slack in the reins, but not enough to spoil the ride. Add this to your beach read haul for summer, though, and you’ll be reading well past sunset. New York: Houghton Mifflin, 1997. One last dictionary book. I’ve not gotten to some I said I would, and some that were recommended, which is why it’s great that there will be an October 2012 when I can do this again. But, wow. I had no idea what I was in for when I picked this one up. The book is saucy, funny, quirky. It has the ghost of a plot, and I grew to like its layered structure as characters, settings and, yes, odd words, reappeared. Each entry defines a word, then uses it in a sentence. It is the sentences that define the book. Those sentences add up to something of a plot, featuring characters and settings from the earlier books. I have not read those books, so I was more lost than might ordinarily be the case when reading a dictionary. The gathering was indeed formidable: a collection of idiot savants holding forth on their specialties while the cognoscenti of contemporary literature skulked off to powder their notions or cowered on couches and passed out on porches among their muted allusions. Don’t you find these soi-disant exemplary sentences outre? I mean, no one actually talks this way! Like the One-Letter Word Dictionary, I picked up this book up on a lark. It was a disorienting read, which is an accomplishment in itself. It’s not easy to get lost on a trip from a to z, but I had a few chuckles along the way. Not a joke. I found this on the shelf in the bookstore when I was looking at other dictionaries. You can explore it online. There’s not an awful lot to say about one-letter words, except that there are more than 1000 of them. Many have to do with Roman numerals, music and science, but a fair few have some surprising definitions. You know the expression, “branded a thief”? To the extent that I had ever thought about it, I’d assumed the phrase was metaphorical. It’s not. Until 1827 in America, thieves were, literally, branded on the thumb with the letter T.
And that is not all. Humans have a long history of shaming and harming each other with branded or incised letters, apparently. In Colonial America, drunkards were forced to wear the letter D, made of red cloth and sewn onto a white ground, so A is not the only scarlet letter. Civil War deserters were branded with the letter D, as well, on the buttock, hip or cheek. The letter was made with a hot iron or a razor. Until 1822, the letter F (for “fray-maker”) was branded on the cheeks of people who fought in church. Blasphemers were branded on the forehead with the letter B. The ancient Romans branded false accusers with a K (for kalumnia, lie), and in England, R was used as a mark for rogues. And on that cheerful note, I end my month of looking at dictionaries. Happy Halloween, everyone! The wonderful Buried in Print suggested this as a read for my dictionary month, and I am so glad she did. (Her review is here.) A finalist for the 2011 Toronto Book Award, this is King’s fifth novel. King has also written eight biographies, and in this book the biographical mode meets dictionary meets fiction. Etienne Morneau, a reclusive young bank clerk who has found a comfortable home with his landlady after growing up in orphanages, is the fictive autobiographer of this novel. In the last five years of his life, he teaches himself to draw and makes thousands of drawings. After struggling for six months to write a conventional account of his life, amounting to just five pages, he adopts the dictionary as his vehicle for verbal self-expression. It is, he says, an attempt to reclaim some order from the chaos arising from his creative burst. From A to Z, he writes scenes and snippets that add up to a life. Now, I’ve been reading dictionaries all month, and I have to say that it’s a form that really does lend itself to a clipping pace. One entry after the next, quick bursts of meaning and information, constant structural milestones that keep you going from A to Z. Yes, for fiction, there is some loss of narrative continuity, but with each entry, you start fresh, and when orphanhood is a prominent theme, that freshness, that lack of continuity, is all the more poignant. The dominance of letters, words, is also striking because Etienne Morneau’s writing is secondary to his drawing. After his landlady finds thousands of drawings in his room after his early and sudden death (heart failure), she contacts a curator at the Art Gallery of Ontario, who declares the dead man a “primitive artist of undoubted genius.” The fictive editor of this autobiographical manuscript does his work 40 years after the drawings are found and celebrated. This belatedness, and the fact that the reader never sees what his art is like, puts us, I think, in a position similar to Etienne’s: outsider looking in. As I read, I wished that this book had been given the T.S. Spivet treatment, with illustrations adorning the margins. But to deprive the reader of access to his visual art, is, after all, part of the impact of the story. 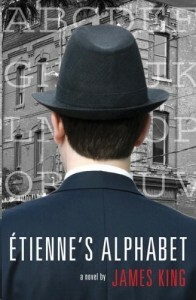 As Etienne writes under BOOK, “For better or worse, pictures–not words–allow me to wander freely in the enchanted world of possibilities.” By depriving the reader of any purchase on what Etienne’s art looks like, we are deliberately left outside of his enchanted world, and we struggle along with him under the encumbrance of words. I have a penchant for facts. No doubt about that. Once, during the middle of an examination by a physician, I noticed the acronym ‘OCD’ in large red capital letters next to my name. H is a model of simplicity and integrity. Its fence-like structure prevents it from having any pretence to handsomeness. The crossbar dividing its two verticals must be rendered expressively for it to have any hope of catching the eye. If a letter can be said to be a wallflower, that claim can be made for H. I often think myself its human equivalent. Luckily, words and pictures allow him much more scope than OCD and wallflower, and his dictionary was a wonderful read. New York: Broadway Books, 2004.
when I realized there were vast expanses of English usage–linguistic Serengetis–that I was not clear about at all, I wrote to a kindly editor at Penguin Books named Donald McFarlan and impetuously suggested that there was a need for a simple, concise guide to the more confusing or problematic aspects of the language and that I was prepared to undertake it. To my astonishment and gratification, Mr. McFarlan sent me a contract and, by way of advance, a sum of money carefully gauged not to cause embarrassment or feelings of overworth. Thus armed, I set about trying to understand this wonderfully disordered thing that is the English language. As I observed in the first edition, the book that resulted might more accurately, if less convincingly, have been called A Guide to Everything in English Usage That the Author Wasn’t Entirely Clear About Until Quite Recently. This is the tone I’m after in the writer of a guide to usage: the perfect combination of earnestness, humour and self-deprecation. I suspect that it is possible that there is a wing of the loony bin for people who read dictionaries, but I will say it out loud: I really enjoyed this book. I learned or was reminded of all kinds of things that I will no doubt have forgotten already, but there are a few entires that stayed with me. bellwether Not -weather. Wether is an Old English word for a castrated sheep. A bellwether is a sheep that has a bell hung from its neck, by which means it leads the flock from one pasture to another. In general use, it signifies something that leads or shows the way. canvas, canvass The first is the fabric; the second is a verb meaning to solicit, especially for votes. vocal cords Not to be confused with chords (groups of musical notes)…. Vocal cords are so called because of their shape and structure, not because of their tonal quality. A little closer to home, I was humbled to discover that E.M. Forster’s 1910 novel is Howards End (no apostrophe). I’ve gone through and corrected on my blog all mistaken references to the novel as it appears in my transcription of Susan Hill’s Howards End is on the Landing. Bryson would point out my careless transcription of the title, but I think he’d be kind about it. In fact, Bryson was, perhaps, a little too gentlemanly, and I searched in vain for jests at the expense of either the British or the Americans. Bryson is an American who has lived much of his life in England, and I had hoped for a bit more of his winning way of explaining one to the other (see his Notes from a Small Island and I’m a Stranger Here Myself for that). barbecue is the only acceptable spelling in serious writing. Any journalist or other formal user of English who believes that the word is spelled barbeque or, worse still, bar-b-q, is not ready for unsupervised employment. But that was as snarky as he got. If you are in the market for a concise guide to usage, I recommend this one. 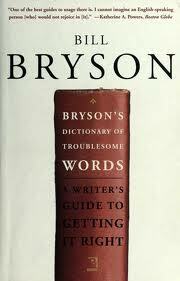 Bryson has covered both sides of the Atlantic, and he refers even-handedly to American and British practice. As a product of both British and American schools, and now as a resident of Canada, I appreciate this. My spelling is nothing if not schizophrenic, and he has helped me do some mental tidying. The Urban Dictionary and I go way back to when I nearly died of embarrassment. Here is my story of why every mother should bookmark the urban dictionary. Every year on our street there is a party. The neighbourhood kids—by which I mean elementary school kids—are out there until midnight, dancing the night away. In our first year in the neighbourhood, I got schooled about the music kids like. Two of my sons have birthdays around the same time as the street party, and I make playlists for the kids’ parties. Raffi meets Talking Heads. The kids dancing away on our street knew the lyrics and dance moves to club music. I loved seeing them bouncing around, catching the glow sticks that the DJ was tossing out, laughing and in a musical world of their own. Clearly I needed to update things. I asked the DJ for some of the song titles to put on the next birthday playlist. One particularly popular song was called “Crank Dat.” It’s quite catchy. I didn’t learn the meaning to the lyrics of the song until I played it a week later at my three-year-old son’s birthday party. I very proudly played my cooler-than-ever birthday playlist. I very smugly observed my sons and my nieces and nephews as they danced around to my latest creation. Then their 24-year-old uncle pulled me aside. Again, in my defense, I did my research and looked up the lyrics on-line before putting the tune on the playlist. There are many versions of the song, and I read several different sets of lyrics, but to be honest, I didn’t have the first clue what I was reading. I thought “crank” was a dance move. It had “hoe” in it, but the line is “Crank dat, Soljaboy. Superman dat hoe.” Now, I know the meaning of “hoe,” and it’s offensive enough, but because I couldn’t make sense of the grammar of the sentence, I dismissed it. I honestly thought that in that context it could mean “Ho!” As in Snow White’s dwarves’ “Hi-ho, Hi-ho, It’s off to work we go.” Nope. Superman is not just a proper noun. Superman is a transitive verb that means to ejaculate on a woman’s back, flip her over onto the bedsheet so that when she stands up the sheet sticks to her and she has a cape. The kids were singing and dancing to this tune, putting their arms up in the air like a crowd of mini-supermen, and somewhere the grown-up hip-hop gods were laughing. I was horrified. Apparently an advanced degree in literature does not entitle you to simply dismiss as harmless a song whose lyrics you don’t understand. And this is why I now have the urban dictionary bookmarked in my browser. Question everything. Look it up, even if you think you understand it. The internet is your friend. The King’s English: A Guide to Modern Usage. London: Harper Collins, 1997. I shall [use for simple futurity or prophesy] will [use for intention, and never say anything that strikes you as unnatural] endeavour [simple is best] try to be a “careful writer” [facetious use of quotation marks] careful writer for this post. It was interesting to read this book as a Canadian. I quite like being lectured to by authors of style guides. Lynne Truss, of Eats, Shoots and Leaves fame, is brilliant at that particularly British form of finger wagging, but, I have to say that she wasn’t telling me anything I didn’t already know. William Zinsser’s On Writing Well is a comforting reminder always to keep things simple, his advice delivered in an authoritative but kind mentor’s voice. An American one at that. Zinsser, I felt, wanted me to learn how to write the best possible version of an essay, he wanted me to succeed, and he was not going to ridicule or belittle me in the process. Properly speaking this book is a guide to modern usage, not a dictionary, but its entries are arranged alphabetically, and it does, as dictionaries do, define words, provide pronunciations, trace etymologies. It also takes potshots, which is rather fun to observe as long as one is not guilty of the mistakes he describes. 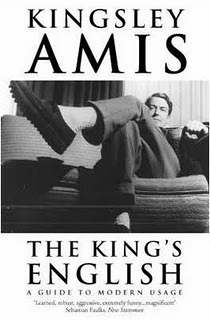 And really, what I found most endearing about this book is the heartfelt homage this King (Kingsley Amis’s nickname) pays to The King’s English, written by H.W. and F.G. Fowler, and H.W. Fowler’s Modern English Usage. His reverence is lovely to behold, perhaps all the more striking in light of what a brute he can be. Kingsley Amis would like us all to be careful writers, but to take the degree of care that he takes requires a degree in philology. The man makes word choices based on etymology: is an Old English or a Latinate word most appropriate here? Then again, I did appreciate his many examples of misused words. I really do admire this kind of attention to detail, this kind of care about the choice of words. His attacks on journalists, in the tabloids and the quality press, are also frequent, as it is they who are responsible for committing to print and then popularizing these kinds of barbarisms. Newspaper headlines are a particular sore point. As for my sore points, the man is an inveterate chauvinist. What can you do but cluck disapprovingly at his ignorance, as he has done to others? Poor man. Thankfully enough people disagree with him on these points to make him an anachronism. The book was published in the late 1990s, though it feels much older (see chauvinism, above), and an edition with an introduction by his son Martin appeared this year. Here is Martin Amis on his father’s book. I enjoyed learning what I learned from this book, but I was aware the entire time of having to avert my gaze from the elephant in the room: as a woman, as a Canadian, I am beneath his notice. He does not expect me to succeed. I will take instruction in future from more likeable teachers.